A snowdrop plant looks a bit like three drops of milk hanging from a stem. This accounts for the Latin name Galanthus which means ‘milk flowers’. Galanthus is a small genus of about 20 species of bulbous herbaceous plants in the Amaryllis family. Most flower in winter, but certain species flower in early spring and late autumn. 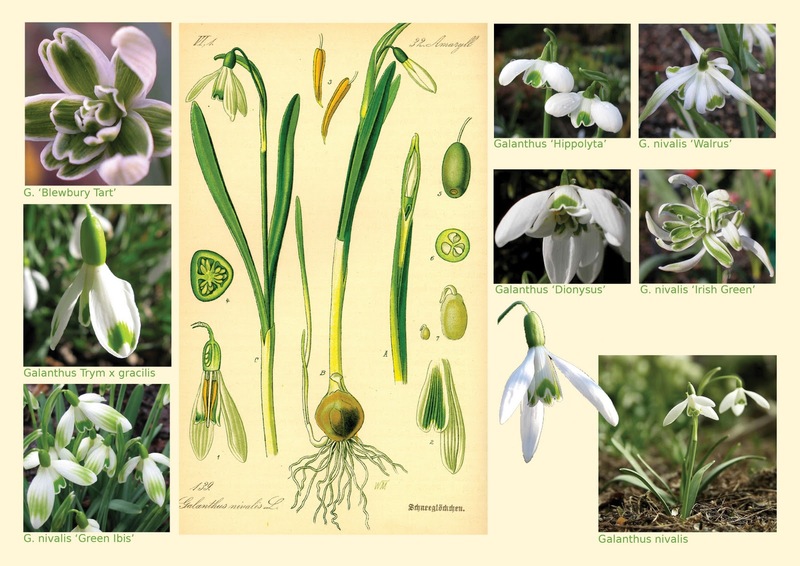 By choosing carefully, it is possible to have snowdrops in flower from January to March. Some early varieties are ‘Atkinsii’ and Hiemalis Group, which are out before Christmas. For late ones choose wide-leaved Galanthus ‘Ikariae’ or G. x allenii, which smells of almonds. If you want huge, try ‘Colossus’. For bell-shaped, choose ‘Diggory’, for twisted leaves G. gracilis, for nearly green, ‘Merlin’. The trouble with snowdrops is there are so many must-haves it is impossible not to become addicted.